If there is any upcoming event like a wedding, birthday party or work meeting, and you want to serve the best dishes to your guests, you should count on one of the many catering companies in London. Their professional service, delicious food and menu designs will surprise and please everybody in the party. However, choosing event catering might be difficult, that is why we’ve prepared a little guide to help you out in the search. Make sure that there is food for everybody. We don’t mean only quantity but also variety. Take into consideration different preferences and tastes among the guests so that you can offer different meals to choose from. For example, there must be a vegetarian option and not only meat dishes. Asides from that, you should bare in mind the possibility of allergies and gluten-free meals must be taken into account too. The best catering service companies in London will be happy to advise you. Think of the kind of event you’re celebrating. It is not the same if you need a wedding catering or it is a birthday party, for example. 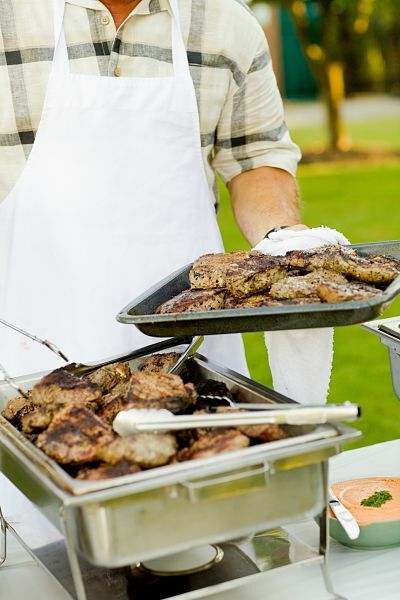 While for the first one you may opt for a sit down dinner, for a birthday catering you might prefer a buffet catering or a bbq catering, for example. Also the location, whether you want an outdoor catering or not. The kind of food may vary when it's outside due to temperatures. Arrange menu tastings and ask for references. You can also ask to friends and relatives and look for opinions online. Considerate the company especiallity. For example, if you are fond of sushi, you can choose a sushi catering. Try to choose always within your budget and make sure that the caterer is telling you the total costs of the catering service and there is not any hidden fee. If you’re organizing an event and need a catering service near you, at Infoisinfo we help you to find the best catering. Enjoy great dishes effortlessly and economically by finding the best catering and food services in our list to make your events stand out and be the best host. Find all the information you need, telephone numbers, address, opening hours and reviews of the best catering services and meals in London.